This is continuation of “Partition of India – How and Why” published on March 12 2018. Due to high fever, severe cough and Flu, I was down from March 20 t0 29 2018, thus the delay in publishing the today’s article. 1. West, which was above 80% Muslim (Green and Dark Green). 2. Center-West, which was 60 to 80% Muslim (Blue, Light Blue and Pink). 3. Center-East, with no obvious majority religion (Brown and Yellow). 4. Southeast, what is now Haryana with Hindu majority, but it was relatively narrow, and the communal split was Hindu / Muslim, with few Sikhs in the mix. Delhi is included in zone 4, because communally and culturally, it was similar to the nearby parts of the Punjab. 5. Which now is called Himachal Pradesh was almost exclusively Hindu (Grey). In June 1947 to determine which areas on ground should make part of each country, Britain appointed Sir Cyril Radcliffe to chair Boundary Commission for Bengal and Punjab. Sir Cyril Radcliffe arrived in India on 8th July 1947. Instead of announcing the result before august 14, 1947, he announced it on August 17, 1947 and, violating even the division on the district basis, divided Muslim majority Assam as well as a 70% Muslim majority Gurdaspur (Punjab). Gurdaspur was divided to provide India land passage to Jammu Kashmir. Strange thing is that 3 Muslim majority districts in central India were made part of India on the plea that those were in Hindu vicinity. It is said that Lord Mountbatten corroborated with Hindu leaders more than his predecessors and acceded out of the way to demands of Mr Nehru, courtesy close friendship of Mr Nehru with Lady Edwina Mountbatten (wife of the Viceroy). To know detail, please, click on the following links one after the other. Formulated at the initiative of Clement Richard Attlee (PM 1945-1951), Cabinet Mission of 1946 aimed at transfer of power from the British Government to the Indian leadership, with the aim of preserving India’s unity and granting it independence. The British wanted to keep India and its Army united, so as to keep it in their system of imperial defence even after granting it independence. 1. 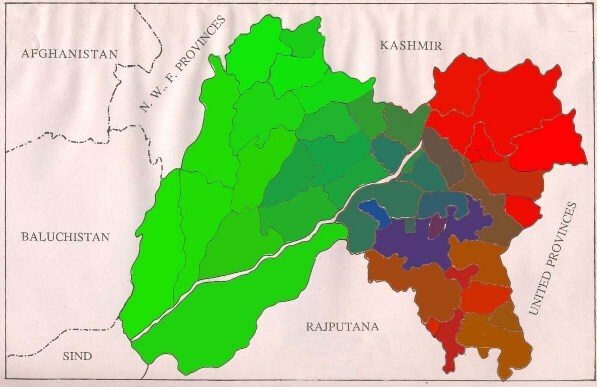 The Muslim-majority provinces would be grouped, with Sindh, Punjab, Baluchistan and North West Frontier Province (now Khyber Pakhtunkhwa) forming Group-1-a, and Bengal and Assam would form Group-1-b. 2. The Hindu-majority provinces in central and southern India would form Group-2. 3. The central government, stationed in Delhi, would be empowered to handle nationwide affairs, such as defence, currency and diplomacy, and the rest of powers and responsibility would belong to the provinces, coordinated by groups. Elections to assembly in India were held during 1945 -1946 in which Muslim League won 30 out of 30 seats of Muslim majority areas getting 90% votes while Gongress won 57 out of 60 seats reserved. In Provincial assemblies Muslim League won 54 out of 66 seats in Upper Province, 13 out of 14 in Central Province, 4 out of 4 in Urissa, 30 out of 30 in Bombay (now Mumbai), 33 out of 34 in Assam, 33 out of 40 in Behar. In developed areas of Upper Province. Congress, which claimed to be a secular party, was able to secure less than 1% votes of Muslims. The Viscount Mountbatten of Burma was appointed Viceroy of India on February 21, 1947. “Mr Jinnah entered politics very late. Earlier he was of no significance. Lord Wavell (Viceroy 1943 to Feb 20, 1947) committed a big mistake of making Muslim League part of the cabinet. Muslim League creates obstacles in the work of national interest.” Later, on advice of Mr Nehru, Lord Mountbatten appointed as his advisor Vengalil Krishnan Krishna Menon, *a stanch Hindu member of Congress*. During next meeting to assess progress on Cabinet Mission Plan, Nehru sabotaging the plan announced, “Congress is not bound by any condition and may change the Plan at the time of forming the cabinet of India”. Mr Jinnah was a shrewd person. He presented the formula of Independent Pakistan. On advice of Mr Krishna Menan, in complete disregard of the joint agreement of division on the basis of provinces, Lord Mountbatten announced on June 3, 1947 the Partition Plan on basis of districts.